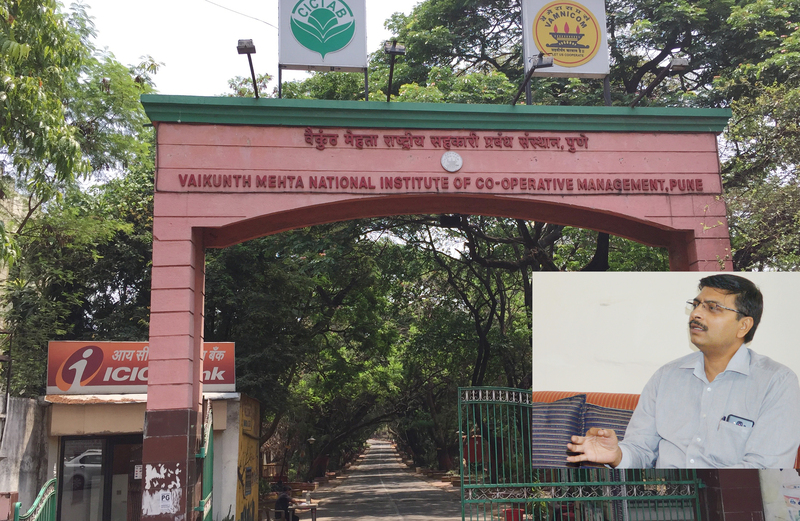 The prestigious cooperative institute in the country Vaikunth Mehta National Institute of Cooperative Management (VAMNICOM) is all dolled up to celebrate its Foundation Day today. Union Minister Radha Mohan Singh would be the Chief Guest. This year, the premier co-op institute is geared to observing the day in style as a number of senior ministry officials are eager to join the celebrations. Additional Secretary Mrs Vasudha Mishra and Central Registrar are also coming. Satish Marathe, a well-known cooperator and an RBI Director has consented to give the key-note address on the occasion. Vamnicom has had smooth sailing for sometimes now after Sanjiv Patjoshi, erstwhile Director left the organization. Patjoshi’s tenure saw Vamnicom embroiled in a number of controversies including the police case and FIRs. Steeped in co-operative values in the true sense, Vamnicom Director K K Tripathy has invited several cooperators including NCUI President and Chief Executive for the event. While Chandra Pal excused himself on the ground of being preoccupied, CE Satyanarayan has sent a regret letter. “I am not here to play politics. My sole aim is strengthening the cooperative movement and like this time, I have invited NCUI leaders and officials every time we organize a function”, says Tripathy. It is only once last year that NCUI Chief Executive N Satyanarayan came to participate, he added. It bears recall that NCUI leadership is cross with the Ministry on the issue of Vamnicom being separated from the NCUI fold. The Board of Vamnicom is no more chaired by NCUI President as was the case in the past. This has led to a lack of interest among NCUI leaders in the affairs of Vamnicom, say insiders. While Patjoshi fueled this fight, the new Director K K Tripathy is said to be a peace-maker. ”I am eager to take everybody on board for the sake of the movement; I had called Honourable MP and NCUI President Dr Chandrapal Singh Yadav for the occasion but he is preoccupied”, said a mild-mannered Director. “I have also invited many Pune cooperators including Mukund Abhyankar and Vidyadhar Anaskar for the occasion”, he said. Besides, Tripathy has been focusing on introducing a variety of value-addition features not only in the cooperative training but also in the campus over the last few months. Roughly one year on his job Tripathy has got an internal road built which saw many accidents in the past. The 2 Km road made from its own fund would be inaugurated by Minister Radha Mohan Singh today, said Tripathy to Indian Cooperative. Another highlight of the day would be laying of the foundation stone for an International Training Hostel in the Vamnicom campus. The proposal was passed by the Managing Committee earlier.